Professional Face Painting in Newquay Cornwall adding colour and sparkle at your celebration or event! Face painting birthday party packages. Children love being transformed into their favourite heroes, animals or characters. 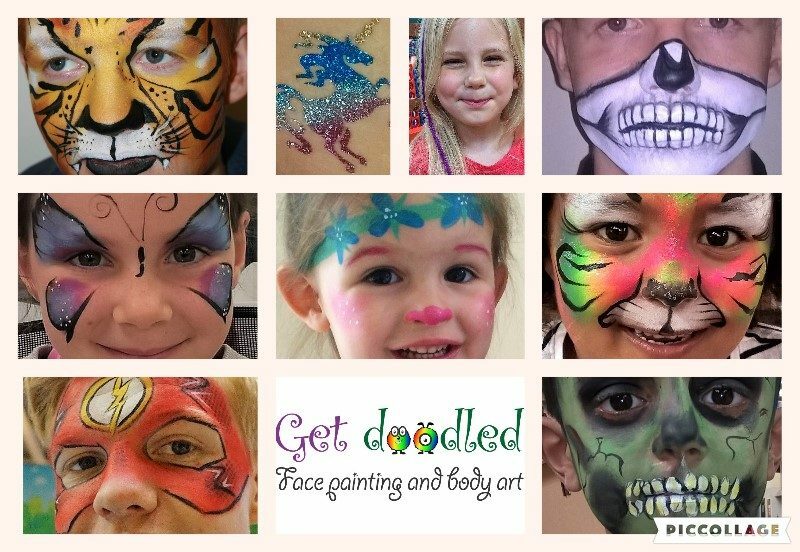 I have lots of colourful arm and face paint designs for your VIP and guests to choose from and happy to create bespoke choices to match your party theme. Get Doodled also has plenty of fun glitzy face paint choices that adults and teens will enjoy too!! Temporary tattoos are a perfect choice for the little ones. There are a large selection of tattoos to pick from, children can choose either a variety of glitter colours or a temporary body ink on their design. The glitter or ink tattoo will be applied to the body, will last between 2 to 7 days and they are water resistant. Want to add some colour to your hair? I have long synthetic feathers or salon ‘A’ grade real feathers in a choice or colours and lengths that I can attach to your hair. Great for kids, teens and adults. Lets get your Glitter on Packages. Glitter and gems are perfect for teens and adults, I can provide a Glitter Bar to help create a glitzy glam or funky festival feel at your upcoming party . I have beautiful glitter and handmade bling that I attach to the face or body using cosmetic grade products. Why not get me round to your pre drinks venue so you can get your glitter on before hitting Newquay town. Packages can be combined and are a great addition to your next celebration including hen & stag, weddings, christenings, birthdays, reunions and ‘Just Because’ providing opportunities for unique photos and lasting memories, so get in touch with Get Doodled for a quote.